The company, Brandless, isn't so brand-free as it claims. For one thing, they've trademarked the term "Brandless"! Despite this small idiocy, I like the concept – a brand that focuses on quality products at unusually low prices by eliminating the middle-men (the sellers). Particularly I like that they carry a number of products that are certified organic that my household uses regularly such as raisins, olive oil and raw apple cider vinegar. I wasn't sure at first that I really wanted to order from Brandless. They only just launched a couple weeks prior to my reading about them on Collective Evolution. A quick search online found me zero reviews on the products! There were lots of articles on different sites explaining their business model, and exclaiming about the $3 for everything price point. 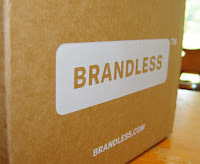 So here I am, posting the very first (to my knowledge) Brandless review. I was particularly impressed that they had a filter for "no added sugar," but I was disappointed to see how many of their products contained sugar in the first place. I even wrote them to let them know that many of their organic products would be appealing to my household if they left out the sugar. To my delighted surprise, I received an immediate response which validated my feedback and encouraged more in the future. Unfortunately, the website's filters seem to glitch every now and then. I went back to the website just now to remind myself all of the options that are available with those four filters on and somehow it filtered out apple cider vinegar and olive oil, among other things, even though I'm very certain there are no animal products or added sugar in their ingredients. I'm sure that they'll remedy this soon. I'll write to them again to ensure they do. Currently available food items that are gluten-free, vegan, organic and have no added sugar: canned black beans, cammed kidney beans, canned garbanzo beans, blue and yellow corn tortilla chips, peanut butter, pasta sauce, salsa, raisins, applesauce, coffee, blue corn taco shells, quinoa, rice, olive oil, coconut oil, raw apple cider vinegar, and mustard. So far I've only tried the corn chips. They were crisp and as I expect corn chips to be, although definitely less salty than other brands I've tried. I would think most health-enthusiasts would consider this a plus. My intuition tells me not to eat many chips (or any), so I only had a few and then set them aside for my husbands. Mostly Greg. He sunburns easily, so I taught him about the magical powder of the antioxidant lycopene, which is most copiously present in tomatoes. Hence, he makes himself salsa on days when he's outside working on building a covered bridge, a solarium, or a stone patio. While I don't recommend salty, dehydrating corn chips as part of an after-sun routine, Greg's favorite way to get a lot of lycopene is salsa with chips. (Yes, we've tried chia crackers and flax crackers as alternatives. They work, but they cost more in base cost as well as labor and electricity running our dehydrator.) Thus, I simply insist that the corn and the oil have to be organic. After all, canola is a major genetically modified crop – so if you're eating organic corn with non-organic canola oil, you may still be eating a gmo! Also, even if the canola oil isn't gmo, if it isn't organic, then it is almost certainly sprayed with roundup. Hence, I was delighted to find out that Brandless corn chips use organic oil as well as organic corn. Overall, I'd say that Brandless is doing a better job than the majority of companies at doing the sustainable, ecological, healthy thing. However, I was rather distressed to see that their so-called "responsibly sourced" notebooks are not printed on recycled paper and they come from China. How can that possibly be responsible? There only statement about their "responsibly sourced" tag is this: "An FSC certified product helps maintain the health of the world's forests for future generations." I feel extreme doubt about huge ships carrying things overseas and then claiming to be saving the world's forests. We have plenty of alternative paper-making sources here such as corn husks. Same thing for their plates – they come from China. I suspect this is a result of their concept of "everything for $3." That sounds nice, but who is paying for whatever we're not paying for? Hopefully not the whales of the ocean. A perusal of their non-food items generally left me unimpressed (with one or two exceptions which I'll get to in a moment). The toothpaste not only contains xylitol and sorbitol, it also contains stevia – undoubtedly the refined, white stevia. It is made in the United States, and yes, it contains great essential oils that are good for your mouth hygiene, but you can take excellent care of your mouth with home-made products and skip fillers such as glycerin (which actually puts a coating on your teeth and prevents your teeth from creating their own enamel effectively). Their hand-soap is sulfate-free, but otherwise just as toxic as most handsoaps from its "fragrance" to its long list of chemical ingredients; I'll stick with Dr. Bronner's, thanks. As I write about in my book, Living Big & Traveling Far on $8,000 a Year (or Less! ), my first approach to boycotting conventional cotton was to buy organic cotton at discount prices as then make my own clothing. That worked for a few years, but I found it particularly troublesome to make my own underwear and impossible to make my own socks. The first company to my rescue was PACT with their great-feeling, great-fitting, super-soft, organic cotton underwear and socks. More recently they've expanded into a growing clothing line. Because of PACT, I can now say my entire wardobe is now either organic cotton, linen, or hemp. I've also supplemented with a few items from Maggie's Organics which is cheaper, but correspondingly not as soft or durable; and from Coyuchi. Coyuchi is the most expensive of the three, but they sell towels of incredible quality and the nightgown I purchased from them is literally the most comfortable sleepwear I've ever purchased. Brandless has something going for it. Hopefully, in time, they'll expand their product lines that are unsweetened and rethink sourcing products from China. If you found this article informative, please do sign up for my e-letters below.